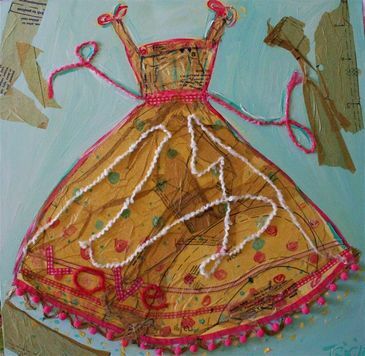 These dresses love to dance and twirl ( oops! how did that bouquet get in there?) I guess the flowers want to dance too! Every dress is carefully tailored with love, candy pinks and fluffy whites, and of course, with great whim! And they are almost ready for their Cherry Blossom Ball. They have been dancing around the room and comparing their styles, fabrics, and colors; swishing around with lots of laughter. 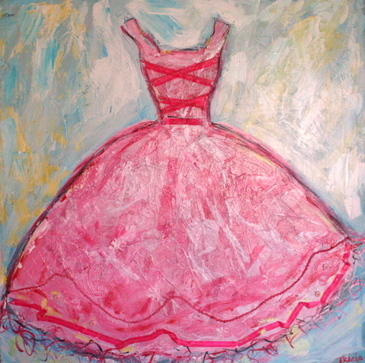 Each dress is ready for her evening of fun and excited about twirling under the sparkly sky. I think the ball is actually going to be in a garden filled with dogwoods and Cherry Blossom trees in perfect fluffy bloom. Little twinkly lights will be hung from tree to tree and pink lanterns will float from the branches. Yes, an April evening to remember! This dress is an inspiration from the movie, Marie Antoinette, which had amazing dresses and design.. oh the colors were beautiful! 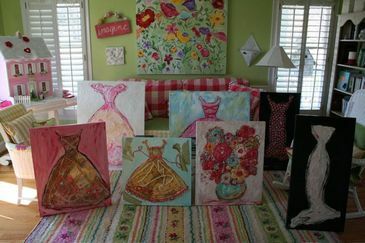 I sat through the movie and sketched out different designs of dresses and fabric colors they used. The flowers in the background of the movie were also beautiful so I sketched some bouquets out as well! Pure artistry at it's finest! 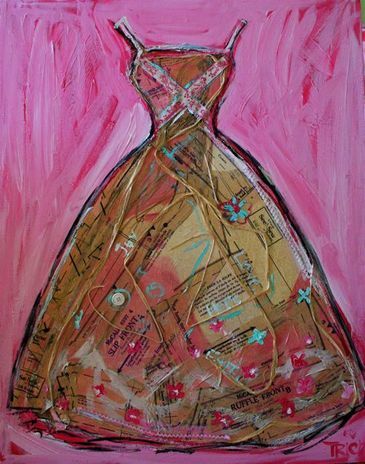 "Vintage patterns" is the song of this dress... Carefully sewn together... well, actually glued together with buttons and raffia ribbon. Another vintage dress, but it's more sundressy and has ribbons, pom poms and yarn. 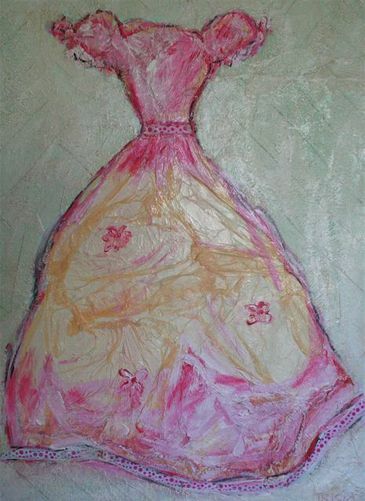 Pink Polk a Dot Fairy dress... tissue paper and ribbon, simple and sweet.